Nestled within Italy’s northern wine country is the quaint Villa del Quar, a building that has stood for more than two millennia. Originally constructed as a Roman fort, Villa del Quar has served as a castle for powerful medieval lords and a home for wealthy Venetian merchants. The Montresor family purchased the site at the beginning of the twentieth century and operated it as their own country estate well into the 1970s. But it was not until Leopoldo Montresor inherited the building that Villa del Quar became a renowned luxury inn. 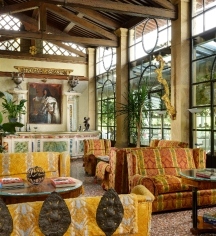 After completing a spirited series of renovations during the 1980s, Leopoldo Montresor opened his family’s villa as a magnificent boutique hotel in 1993. To this day, Villa del Quar continues to amaze the countless guests it hosts from around the world. Villa del Quar features 25 rooms in total: 13 suites and 12 double rooms. Guests looking for a rustic and authentic culinary experience may dine at the villa’s Arquarde Restaurant, headed by an ambitiously talented chef, Alessio Cera. Chef Cera offers to guests only the finest in locally-inspired Mediterranean cuisine. Villa del Quar also has several beautiful halls and dining areas for those interested in hosting their own private gatherings. With stunning beauty and historic charm, each room provides the perfect setting for professional events and family weddings. And through the special "Villa in Exclusive" package, the Montresor family has generously granted an opportunity for guests to rent the entire Villa del Quar for their personal use. Guests may immerse themselves into the fantasy of owning an actual Italian villa, in which the whole building becomes theirs for several days. 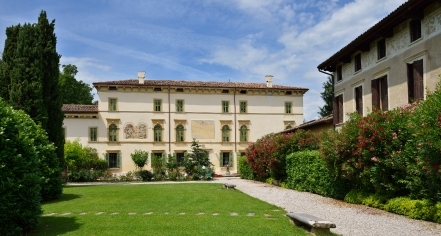 Surrounded by the historic Valpolicella valley, Villa de Quar is the best spot to begin a journey into northern Italy. The staff at Villa del Quar can help guests plan a trip to the famous vineyards that dot the local landscape, or into one of the many medieval villages that line the winding country roads. Guests can take in the lovely, picturesque sights at Lake Garda, situated nearby in the foothills of the Alps. The ancient city of Verona is also only a short drive away from the hotel. A UNESCO site since 2000, Verona has an endless amount of cultural attractions that anyone will appreciate. Additional cities bearing the UNESCO designation are close to the villa as well, including Sabbioneta and Castellaro Lagusello. Villa del Quar is a wonderful location for any world traveler eager to discover Italian culture. Villa del Quar, a member of Historic Hotels Worldwide since 2018, dates back to at least 47 A.D.
“Quar” means “fourth mile from the city of Verona” in Latin, first coined among Roman travelers navigating the Via Claudia Augusta. Original Property Opened: 47 A.D. Cancellation Policy: Cancellations must be made 7 prior to arrival during the low season, or 21 days prior to arrival in the high season. Deposit: A deposit maybe required. Early Check-In/Late Check-Out: Available, depending upon availability; fees apply. Payment: All reservations must be made with a credit card. Pet Policy: Small pets are allowed free of charge; pets must be kept on a leash and may not enter the restaurants. Transportation: Helicopter transfer can be arranged through the hotel staff. Learn more about the History of Villa del Quar .